Gift Notary Seals come with a lifetime warranty and are guaranteed to meet all state specifications for notary supplies. Contact Us to find out if one of our gorgeous gift seals are the correct product for you. 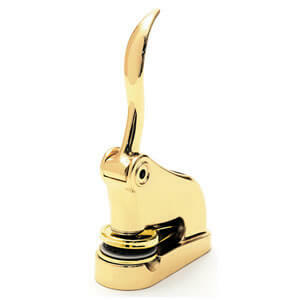 Not only is this Gold Notary Gift Seal elegant but it is also exceptionally useful. With a beautiful gold finish that is sure to dress up any office, this Notary Gift Seal is a great gift for newly commissioned notaries. Complete with a felt anti-slip grip on the bottom, this embosser is capable of reaching up to 1 1/2" from the paper's edge. Customized dies are made from Delrin - an extremely durable material - with the latest technology. With stunning craftsmanship and a hand-polished finish, this Chrome Notary Embosser will definitely turn heads. 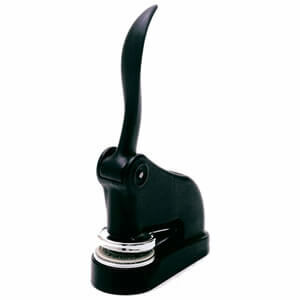 This Chrome Notary Embosser comes with an insert that is simple to remove and easy to replace. Felt lined, preventing any damage to your desk, this embosser will be a great addition to your notary supplies and keep you looking professional. If you're looking for a notary gift seal that is a bit more subtle than the chrome or gold models, this matte black notary gift seal is the product for you! Suitable for one piece of 24-26lb paper at a time, this matte black gift embosser is a smart edition for any notary - no matter how long they have been commissioned. Whether you are a brand new notary or an established notary - you will love these brilliant notary gift seals.